How Did Orrin Hatch Become the Savior of the Democratic Party? Just to paint a picture of how dismal the political landscape appears to liberal Democrats, there are no good options after Trump is impeached. And make so mistake about it, liberal Democrats want Trump impeached in the worst way. They will literally take anyone right now besides Trump and his family. That means anyone. It means the vacuous and complicit Mike Pence. It means the shallow and flimsy Paul Ryan. It means the corrupt Rex Tillerson. It even means the Secretary of Treasury Steven Mnuchin. Democrats will take any of these characters, just as long as it means Trump is dethroned from his perch. After Mnuchin, the line of succession gets even more bizarre and incompetent by liberal definitions. “Mad dog” James Mattis as Commander in Chief? Jeff Sessions as President of the Confederate States? Ryan Zinke? Sonny Perdue? These are all laughably incapable presidents, yet they are all more desirable than Trump. The bottom of the list is even worst, yet Wilbur Ross at Commerce, Alexander Acosta of Labor, Tom Price, and Ben Carson are all preferable. That is how bad it looks right now if you are a Democrat seeking impeachment. Practically speaking, if the Democrats do choose to remain within the confines of Constitutional guidelines concerning succession, the real hope is not way at the bottom with the likes of Rick Perry and John Kelly. The better choice would be way up at top at number four with Senate President Pro Tempore Orrin Hatch. Again, this is a sign of how bad the landscape is for Democrats seeking impeachment, yet it is a way out of the Trump nightmare that has at the very least a coherent strategy. Orrin Hatch has been in office since 1977. Hatch is the most senior Republican Senator, and the second most senior Senator overall, after Patrick Leahy of Vermont. He has served in government for 40 years, which makes him the longest serving Republican Senator in U.S. history. From 1993 to 2005, he served as the chairman of the Senate Judiciary Committee, as chairman of the Health, Education, Labor and Pensions Committee, and on the Board for the US Holocaust Memorial Museum. 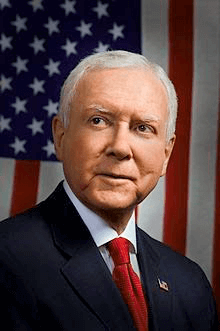 Could it be that the salvation of the Democratic Party is not Barack Obama, Hillary Clinton, Bernie Sanders, Joe Biden, Elizabeth Warren, or Corey Booker, but the Senior Republican Senator from Utah Mr. Orrin Grant Hatch?